Former Virginia Sen. Jim Webb said in an email to supporters Thursday that he will run for the Democratic nomination in 2016. "After many months of thought, deliberation and discussion, I have decided to seek the office of the Presidency of the United States," said the email. Unlike his fellow candidates on both sides of the aisle, Webb opted for a lengthy email outlining his policy positions rather than a splashy rally to introduce himself to the public. "Our country needs a fresh approach to solving the problems that confront us and too often unnecessarily divide us. We need to shake the hold of these shadow elites on our political process. Our elected officials need to get back to the basics of good governance...and at the same time our fellow Americans need proven, experienced leadership that can be trusted to move us forward from a new President's first days in office. I believe I can offer both," the note said. A former Marine and decorated war hero, Webb was an assistant secretary of defense and secretary of the U.S. Navy before becoming a senator. He served for just one term before retiring in 2013. In the note, he reminded supporters, "I have spent my entire life around the American military." Though it seemed like it might be the end of his political career, Webb surprised some last November by becoming the first Democrat to take the step of forming a committee to explore a presidential bid in 2016. He has spent the spring traveling in Iowa and New Hampshire to talk to voters. Who’s up and who’s down in 2016 race? The chief rationale for his candidacy is foreign policy, and Webb was quick to write that he would not have supported an invasion of Iraq as president. "Nor as a Senator would I have voted to authorize it," he said, an unwritten contrast with former Secretary of State Hillary Clinton's vote in favor of the war in 2002. She has since unequivocally said that she "got it wrong." But Webb's implicit criticism of Clinton doesn't stop there. He also wrote, "I would not have been the President who used military force in Libya during the Arab Spring," an approach favored by Clinton. "I warned repeatedly that this use of our military did not meet the test of a grave national security interest, that it would have negative implications for the entire region, and that no such action should take place without the approval of the Congress. The leadership in the Congress at that time not only failed to give us a vote; they did not even allow a formal debate, and the President acted unilaterally." He also wrote that he would not sign an executive order that establishes a long-term relationship with Iran if it accepts Iran acquiring nuclear weapons, and argues Congress and the administration to look "very hard" at the terms of a pending nuclear deal. On domestic issues, Webb asks his supporters to, "look at the results we were able to obtain during my time in the Senate." The email outlines a host of things he would do as president, including restoring economic fairness, making tax laws more balanced , rebuild infrastructure, fix the education and criminal justice systems, and reform the immigration system. Webb also promises to "clean out the manure-filled stables of a political system that has become characterized by greed." Webb was born in Missouri in 1946 to a military family that relocated frequently during his youth. He graduated from high school in Nebraska and spent a year at the University of Southern California before finishing his undergraduate degree in 1968 at the U.S. Naval Academy. 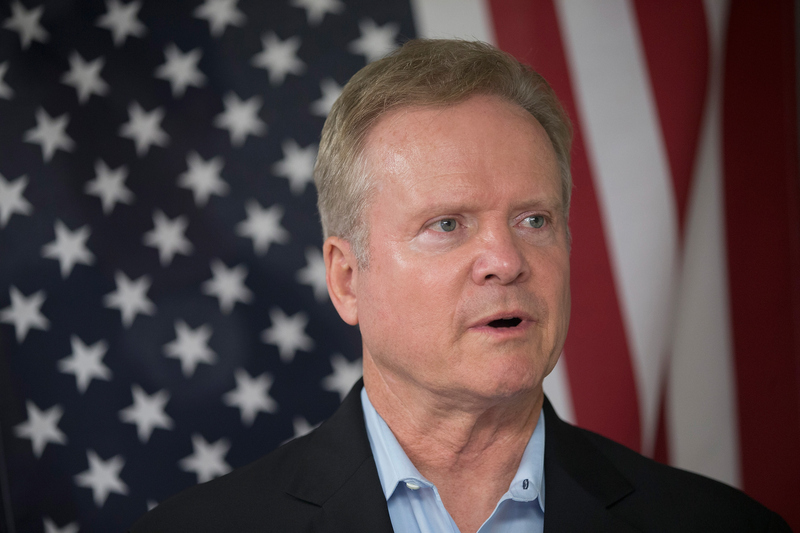 Could Jim Webb pose a threat to Hillary Clinton in 2016? After college, Webb was commissioned as a second lieutenant in the U.S. Marine Corps and sent to Vietnam. He distinguished himself in the war, earning a Navy Cross, two Purple hearts, the Silver Star and two Bronze Stars, and he was soon promoted to first lieutenant. Due to several injuries he sustained while fighting, Webb was granted a medical retirement shortly after he returned home. He received his law degree from Georgetown University in 1975 and soon joined the staff of the House Committee on Veteran's Affairs. In 1984, Webb was appointed Assistant Secretary of Defense under then-President Ronald Reagan, and in 1987, Reagan appointed him Secretary of the Navy. He resigned from the post in 1988 due to a dispute over the size of the Navy and spent the next few years as a filmmaker and author. In 2006, Webb ran as a Democrat against then-Sen. George Allen, R-Virginia. He campaigned as a strong opponent of the Bush administration's war in Iraq, famously wearing the combat boots of his son, who was fighting overseas, at all of his campaign events. Allen was heavily favored to win the race at the outset, but after he came under fire for directing the slur "macaca" at a South Asian man tracking one of his events , Webb surged to victory, pulling off the most surprising Senate victories in recent memory. As senator, Webb was remembered primarily for delivering a well-received Democratic response to Mr. Bush's 2007 State of the Union address, and for his efforts to pass a 21st century G.I. bill enabling more veterans to go to college and receive job training. Much of Webb's political persona draws on his heritage as a Scotch-Irish American with roots in Appalachia and Middle America. He's counseled Democrats not to give up on attracting the white, working-class voters who have sided against them in recent elections, and he's calibrated his message to appeal to dispossessed Americans in both rural and urban areas. That's led him to embrace a type of economic populism, supporting efforts to tackle income inequality and rein in Wall Street. But it's also allowed him to stake out more conservative positions on cultural issues like gun control and affirmative action. A Webb victory in the Democratic primary is very unlikely. Unlike Clinton or Vermont Sen. Bernie Sanders, he tends to get just a few percentage points in the polls, more on par with former Maryland Gov. Martin O'Malley and Lincoln Chafee, the Republican-turned-Democrat former governor and senator from Rhode Island.